The Baby Home Dream Portable Cot has been designed in a very intelligent way where it is nylon outside so it becomes easier to clean and is not going to get dirty easily – at least the dust or dirt is not going to stick onto this. Nylon also has a natural shine to it, so the look of it is also pleasing. However, if you peep inside then you will know the inside is made of cotton – so that it can keep your baby the ease and comfort that only cotton can give. 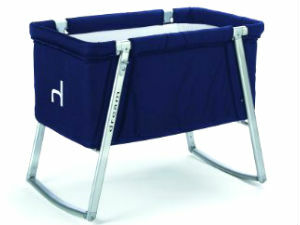 This is a rare feature and will ensure your baby is safe and comfortable all the time you put it in this cot. The Baby Home Dream Portable Cot is lightweight and can be mantled and dismantled with ease – this is just not rocket science and is simple that you can do this without anybody’s help. You can literally take the cloth out of the aluminum body and completely wash the whole thing – so it’s perfectly washable and once you have washed and dried this and you need to take it to a holiday spot you are planning to go to, you can still put it in the travel bag and take it along – so this makes it portable in the literal sense of it, not just in parts like some other products claim. One other feature that will impress you is the feature that you can choose on the Baby Home Dream Portable Cot. You can switch on a button and your baby will be rocked on the cot – you can imagine what kind of comfort this can give the baby – especially when your little one is on the verge of slipping some gentle rocking is only going to be more comfortable. The Baby Home Dream Portable Cot also comes with two mattresses that will comfort your baby even more, so you can choose which of these you use. At times when you don’t need to rock, like times when the baby has slept and any more movement might disrupt the sleep of the baby, you can just switch the button back and this will just let the cot stay still. So this way you can be rest assured that your little one will enjoy a tranquil sleep without any disturbances. This is another rare feature of the dream cot, which will just entice you.